Home Weapons How Good Is Thunderlord In Destiny 2? Unless you’ve been living under a rock for the last month or so you’ll be aware that Thunderlord is now a weapon in Destiny 2. This Exotic Machine Gun, the first to be in Destiny 2, has been brought through from Destiny 1. It was even used in a promo video for Destiny 1 when it was first shown at E3, and for many Guardians that has cemented it as a staple weapon for the Destiny universe. But Thunderlord has changed during it’s transition between games, making it a completely different beast this time around. Let’s take a look at the stats and perks that we now have on Thunderlord. The stats on Thunderlord for Destiny 2 haven’t been listed by DestinyDB just yet, so we’ve only got a rough idea of what they are for it right now. 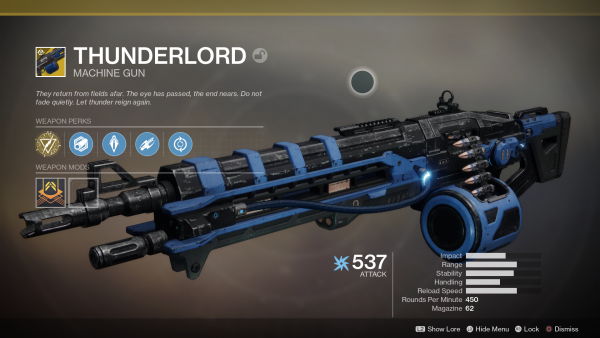 From the looks of images of Thunderlord the stats are; fires 450 Rounds Per Minute, Magazine Size of 62, Impact around 50, Range around 70, Stability at about 67, Handling around 45, and a Reload Speed of about 80. These stats are a bit of an upgrade on the Destiny 1 version of Thunderlord, not that it needed it. In Destiny 1 Thunderlord was a bit of a powerhouse because you held down the trigger, watched the shots get faster, and the lightning spark between your enemies. Now the perks have also changed for the Destiny 2 version of Thunderlord, but that’s definitely not a bad thing. The Exotic perk on the Destiny 2 version of Thunderlord is Reign Havoc. This perk generates lightning strikes from above with kills. This perk in particular is a massive upgrade on Destiny 1 Thunderlord, and if you take a look at any videos of the weapon in action you’ll see just how overpowered it makes the Machine Gun look. The other perks that have been seen on Destiny 2 Thunderlord, though they might change thanks to random rolls, are; Polygonal Rifling, which increases Stability, Armour-Piercing Rounds, which slightly increases Range, causing extra damage to enemies and overpenetrating shields, Lightning Rounds, a perk that will probably still to the weapon, which makes Thunderlord fire faster and with more accuracy the longer the trigger is held down for, generating lightning strikes with continuous damage, and Feeding Frenzy, which increases the reload speed for a short time after kills. These perks build the Destiny 2 version of Thunderlord into a true legend. It’s less of an upgrade to Machine Guns and more of a totally individual weapon like most of the other Exotics in Destiny 2 Forsaken. If you’ve yet yo head out into the world and find Thunderlord in Destiny 2 then you should really get on it. The weapon won’t be available after the 27th of November, and the quest is pretty simple to complete in three easy parts. Here are our guides to those parts; Part 1, Part 2, and Part 3. Let us know what you think of the new version of Thunderlord in the comments. Bec sure to check out the video below for a look at what you can do with this weapon.